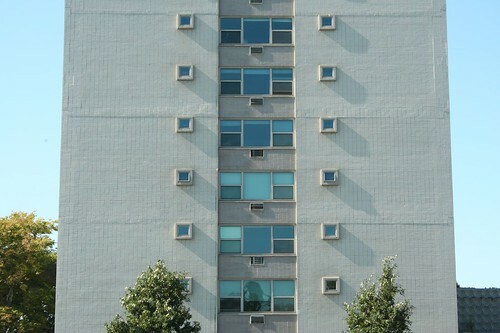 Continuing an exploration of the Midcentury Modern apartment towers along Chicago’s lakefront. 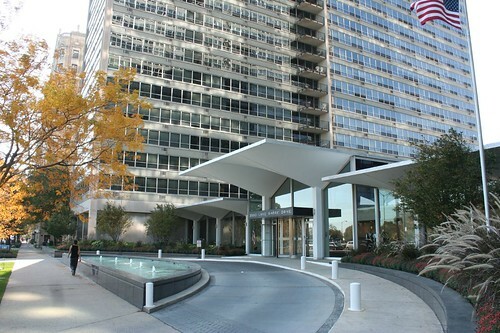 A scheme used several times along the lakefront involves a pair of similar or identical high-rise towers, with a low-lying lobby connecting them. 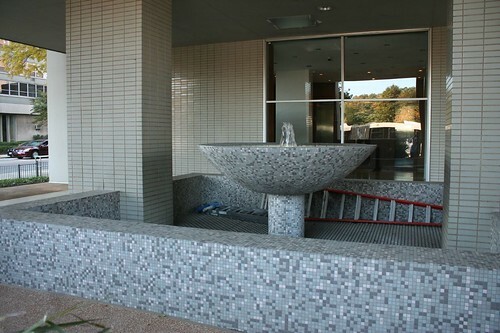 The lobby often opens onto a drop-off driveway, usually has a doorman or security worker, and typically serves as a point of architectural elaboration. 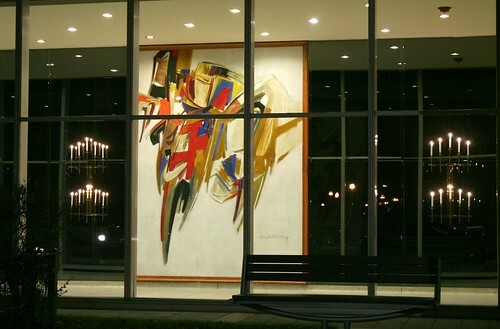 Some contain large-scale artwork. This type of planning keeps a lot of open air on the site, allowing tall towers to retain a view, and fits with the Midcentury trend toward “towers in the park” – a fitting scheme so close to the lake. 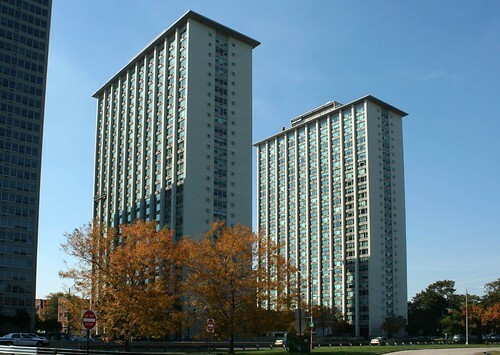 These buildings made spectacular lakefront views available to thousands of families. 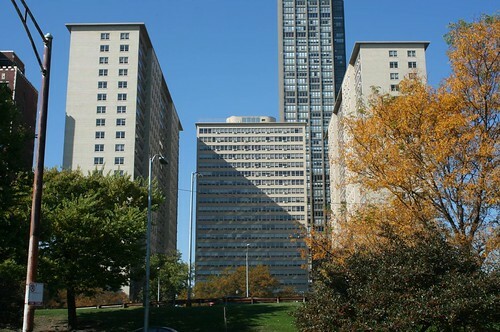 Builders John J. Mack and Raymond Sher broke ground in March 1955 for what was then Chicago’s largest apartment building, with 23 floors, 662 apartments and a projected cost of $10 million. The building is precisely contemporary with downtown’s Prudential, the first tall building to go up downtown since the Depression. Features included a 400 parking space garage, 10 high speed elevators, and gas range kitchens. Occupancy began in June 1956 and by December the buildings were more than 2/3 filled; it was heavily favored by young families, with rents running from $140 to $235 per month. A 37-person cleaning staff kept the building running, vacuuming corridor carpets daily, constantly cleaning the 6,000 windows, and hauling out two tons of garbage daily. It’s only clearly visible from the air, but the structure is not symmetrical – the southern tower is offset from the other two, pushed slightly east. Vacant at the time of construction, the land had 20 years prior been home to the mansion of Countess Sarah Victoria Cavicchia. I must here humbly submit a correction: when I briefly wrote about this building last year, I misread an article about 1550 Lake Shore as being about this building instead. 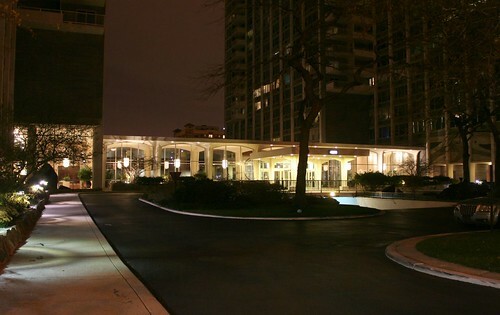 3950 did not, to the best of my knowledge, have the rooftop dining and party space that 1550 has. Those wonderful curved penthouses look like they’re purely for mechanicals, and the tower rooftops don’t appear to have any resident access at all. 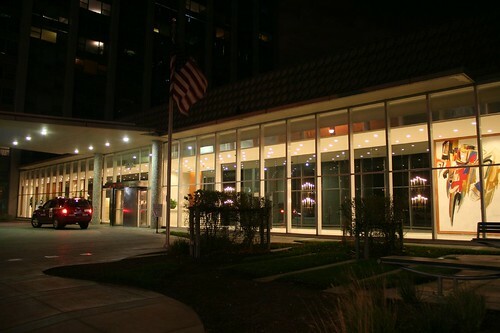 Twin towers with a vertical emphasis, connected at the base by a common lobby with a landscaped roof. 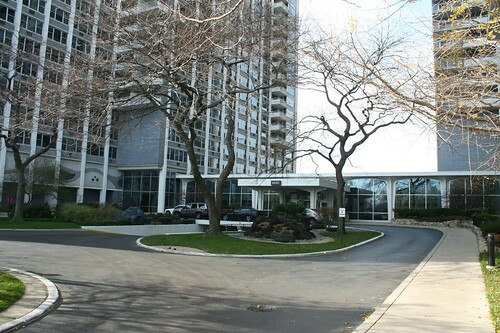 3600 North Lake Shore is all about rectilinear forms – square tiles, square windows, rectangles of brick outlined by rectangles of stainless steel. Naturally, its two biggest decorative elements are curves – a mesh of steel hoops over the lobby, and the curved front of the porte cochere. The land was previously home to Issac Miller Hamilton, president of the Federal Life Insurance Company. Construction on the towers began in April 1959; the buildings opened in June 1960. 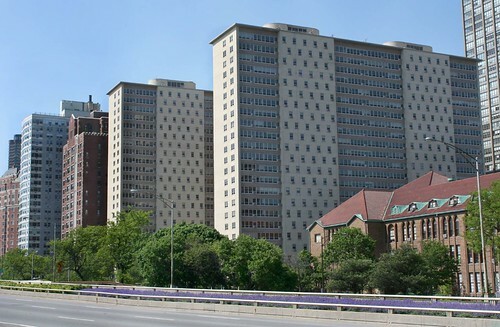 Its 640 apartments made it the second-largest apartment house in the city. 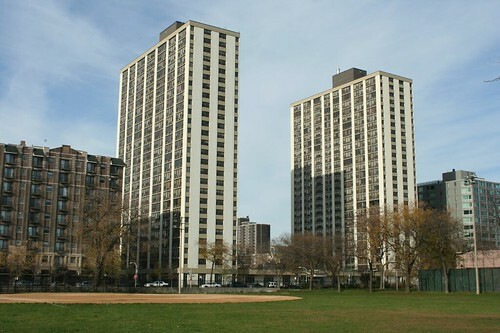 The building, like 3550 just to the south, was a Mack & Sher project. A hair salon named Fred’s Coiffures operated in the lobby, along with a small gift shop. The building’s relatively small lake-facing windows apparently generated some controversy and discussion among locals; the smaller windows serve bathrooms, while the larger windows in the center are for the bedrooms. True lake views are intended to be from the south and north facing facades, which are generously glazed. Alfred Shaw explained the decision as a result of his own east-facing windows which required him to draw the blinds every morning. Apparently geared towards middle-class professionals, the building and its residents made little noise in the headlines during and after its construction. 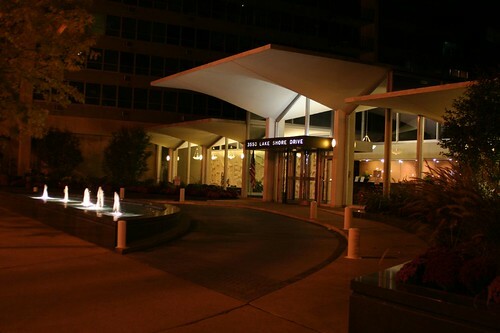 Shaw Metz & Dolio, the lakefront’s most prolific Midcentury architectural firm, formed in 1947 when architect Alfred Shaw withdrew from a previous partnership and allied with structural engineer Carl Metz and electrical & mechanical engineer John Dolio. That same year the firm landed the job of finishing out the interior of the Baha’i House of Worship on the north shore. They firm had a flurry of business in the 1950s as they worked on several large housing projects, downtown buildings, and entered a competition to design St. Peter’s Church downtown (their entry did not win.) John Dolio would eventually split off into his own engineering firm, which continued to work with Shaw & Metz. 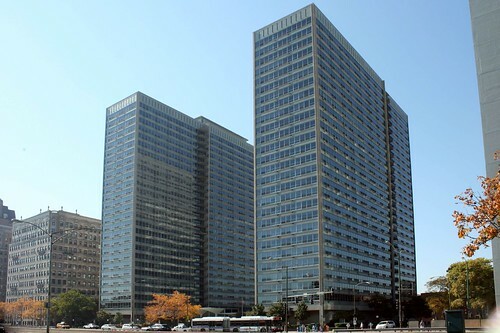 Much of their work was for developers Mack and Sher, whose portfolio of nearly a dozen major lakefront buildings was run by Lake ShoreManagement Company. 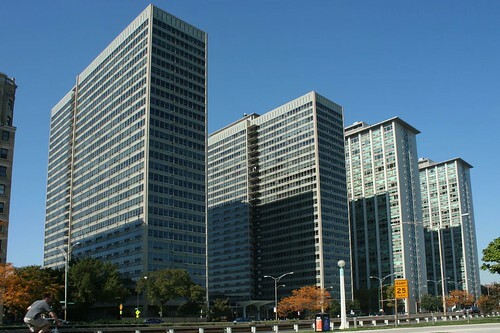 Just across Addison Street to the south, another building with the same concept – two massive slab towers conjoined by a low-lying lobby – opened in 1962. Lake Shore Management Company billed it as a “distinctive twin tower architectural masterpiece…providing fabulous views of lake and city”, with studio, one and two bedroom apartments. 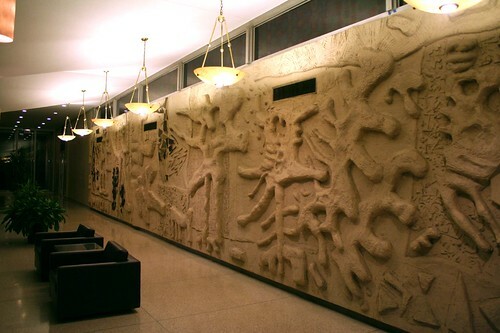 More on this building’s wonderful lobby sculpture here. 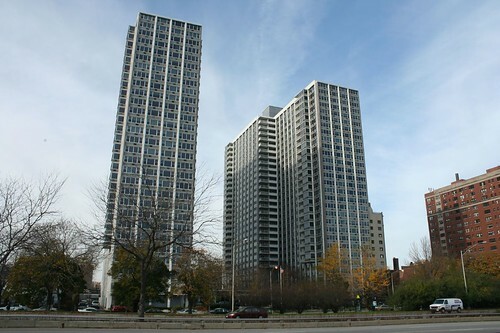 Developed by Albert R. Robin, the 29-story Imperial Towers contain 432 apartments per tower. Construction began in 1961; occupancy started in August 1962. 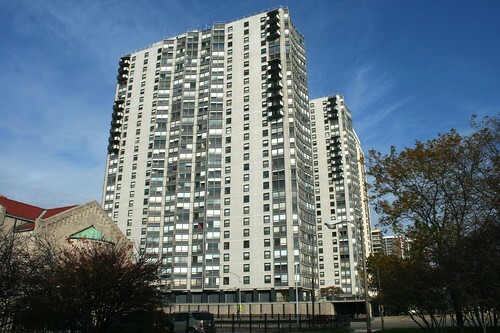 It was one of many Chicago projects insured by a section of the national housing act. 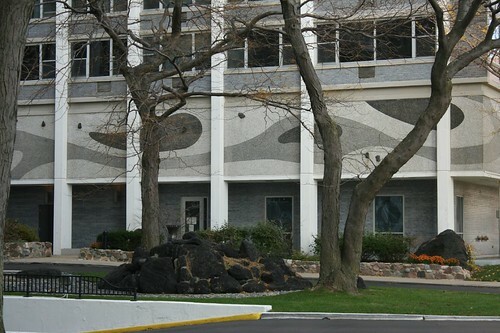 The building was marketed as luxury for the budget-conscious, and was intended to attract a mix of older, retired residents and younger families – the owners went so far as to tout a social ambition of giving seniors the choice of “mingling with the younger generations” when and if they chose. Amenities included an “Olympic” sized rooftop swimming pool over the garage (25 yards, actually, which isn’t Olympic sized at all), and several small stores in the lobby including a coffee shop, a beauty salon, Imperial Drug, and the first of several Jewel Pantry stores, high-end groceries in luxury apartment buildings with a large selection of prepared foods, exclusively open to building residents. The building has a 250 car garage, accessed through a ramp in the courtyard that went right under the lobby. A less-touted feature, detailed in a New York Times article, was that the garage could be “converted into a fall-out shelter” with room for the building’s population and hundreds more, equipped with emergency generators, special ventilation, heat, water, light and food. Always reassuring in the Cold War age! 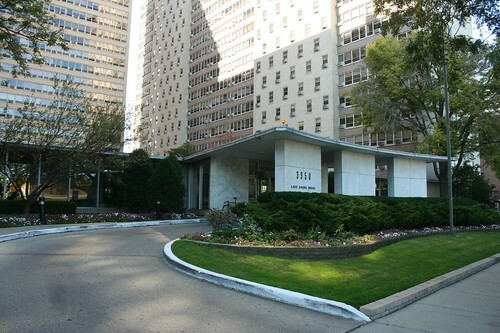 The building converted to condominiums in 1977. 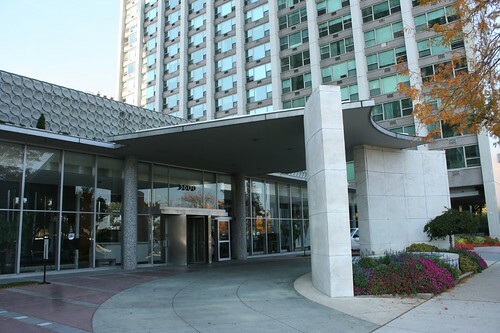 Imperial Towers features a Japanese decorative theme, with what were touted as Japanese gardens in the courtyards as well as on the lobby roof. Like many before them, the developers pulled no punches in describing their building, labeling it “America’s most fabulous building” in a 1963 ad. 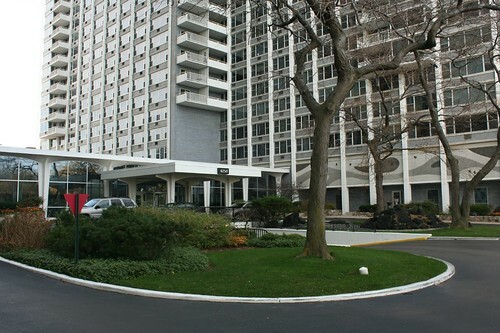 This entry was posted in Lake Shore Drive, Midcentury Modernism. Bookmark the permalink. Ah, all my neighborhood twin towers! I've mostly thought of them as ugly behemoths (I'm partial to vintage brick and stone) but your write-ups of mid-century modern buildings always make me see them in a new light.I once toured a condo in the 3600 building. I believe the lake-view bedroom windows are for one end apartment, with the second bathroom window the only eastern exposure for the other end unit. I had to stand on the toilet and crane my head into a veritable tunnel to see out that bathroom window! I'm sure you didn't forget the twins on the south side and are saving those for a future post… aren't you? *grin* Hyde Park has three, well, no, four and there are a few in South Shore too. 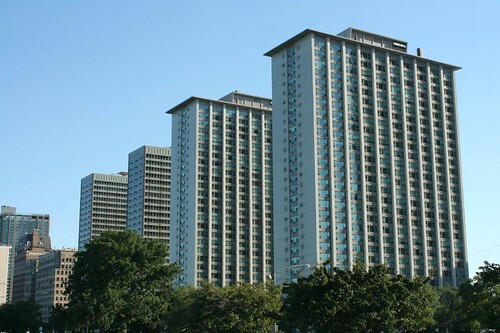 One set, Regents Park (where the POTUS used to work out) was just in the news – it's still a rental building – the new owners foolishly ticked off the tenants, who have been active before, by firing the entire building staff! You did a nice job documenting them too. I'd love to see old photos of 3550's original lobby furniture and lighting as well as Imperial Towers full on Mock Ming Dynasty decor (the units also featured worm wood paneling and crazy screens to hide the kitchens). I have to say I like a lot of New York's white brick buildings, but Chicago was really big on blond brick in that era too. I hadn't quite realized that, really, we have quite a lot of them too (and probably with better floor plans). There seems to be a hygienic background to the use of white brick on facades initially (it would've been used mainly in lightwells and enclosed courts to lighten them).